Chris Long is old, but good. For Eagles fans who watched Super Bowl LII at a loud and raucous bar, the din of voices overpowering the NBC broadcast was probably a blessing in disguise. Everyone else heard Chris Collinsworth and (to a lesser extent) Al Michaels falling all over themselves to grasp why the officials weren't biasing their calls toward the Patriots. Anyone else wishing they could mute Cris Collinsworth? Without question, there were some close calls in Sunday night's game, specifically Cory Clement and Zach Ertz's touchdown catches. You might think Collinsworth, a former wide receiver for the Cincinnati Bengals, would have a pro-catch mindset as his baseline for judging these tight windows. Apparently not, seething Eagles fans learned. The Eagles have been Super Bowl Champions for three hours, and Cris Collinsworth is still in the booth, trying to figure out a way for the Patriots to get back into the game. One of my lasting impressions of that Super Bowl will be Chris Collinsworth trying to convince the world that the Zach Ertz TD wasn't a catch. Gene Steratore's officiating crew defied the stomach-turning pattern of other NFL crews during the regular season. His team actually called plays based on sound visual evidence. They didn't hem and haw over the sanctity of interpreting rules the NFL tweaks practically every year, repeatedly ruining games at critical moments. Collinsworth tried to compare Ertz's touchdown to the overturned Jesse James touchdown in a late-season matchup between the Patriots and Steelers. The two aren't even really close, as you can see below, and people were outraged that James' wasn't awarded a catch. 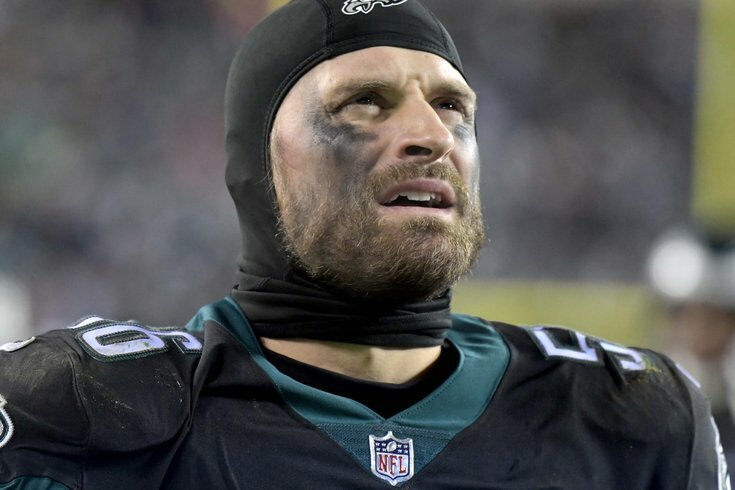 Eagles defensive end Chris Long agrees with all of the fans who have been attacking Collinsworth's play-by-play performance. Watching the rerun of our game on NFL Network.... not sure it’s sunk in yet. It’s way less nerve racking and way more entertaining when you know how it ends!!! It's doubtful that Long would go out of his way to do this on account of his dad's working for FOX, either. Collinsworth's Twitter account has been ominously silent since the Super Bowl. At least Long confirmed what everyone else outside New England and Pittsburgh heard.